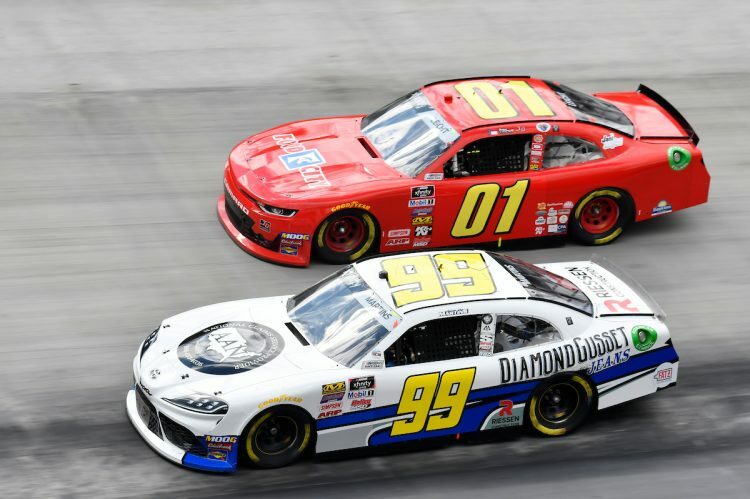 Over the weekend, the NASCAR Xfinity Series went back to its’ roots on the short track at Bristol Motor Speedway for the running of the Alsco 300. Bristol, which is affectionately known as “Thunder Valley”, has a reputation among drivers and teams alike as being a treacherous track that has things happen in a hurry. This weekend’s outing was boosted significantly with a team-wide sponsorship from local Tennessee grocery store, Food City, who jumped on board all four JD Motorsports with Gary Keller (JDM) cars just before the team loaded up for the track. BJ McLeod, who drove the No. 15 Food City Camaro in Saturday’s 300 lapper, was eager to get back to the short tracks, where he has thrived at throughout his career. After starting from the 23rd position, McLeod methodically went to work on picking up spots where he could while also keeping his #15Machine out of trouble. As it turns out, BJ was able to come home with his season-best finish, an 18thplace run. This was also his best career finish at the Tennessee short track, and he was able to gain some valuable points on the competition ahead of him in the season points standings. McLeod currently sits in 22nd in NXS points, just twelve markers back of the Top 20. Following right behind BJ was Garrett Smithley, driver of the No. 0 Food City Camaro. Garrett, who qualified his Chevrolet in the 26th spot to start out the day, ran from 20th to 25th place for most of the afternoon in his #NumberNuthin Chevrolet. However, a late caution gave him the opportunity to make up a lap via the wave around, and he was able to then fight for a Top 20 spot. Ultimately, he crossed the line in 22nd, but was able to put some notes in the memory bank for when the series returns to the track in August. He remains in 18th place in the season points standings. Local Asheville, N.C. driver Stephen Leicht grew up roughly only an hour or so from Bristol, so he had somewhat of a “homecoming” this weekend. The day started off great with Leicht advancing to Round 2 of Qualifying, but since the team opted to not run a lap in the round to save tires, their time was disallowed, forcing Stephen to start from the rear of the field. From there, Stephen worked his way through the field, impressing many by staying on the lead lap despite starting so far back in the field. However, two thirds of the way into the race, engine issues plagued the 01 team once again. The bad luck seems to continue on for Leicht’s group, but they are eager to head to Richmond, a track Stephen has had good success at in the past. He currently sits 28th in points, as he drops a couple positions due to coming home with a 32nd place finish. And for the first time this season, Ross Chastain failed to finish his race due to an on-track incident. After making it to Round 3 of Qualifying and ending up with a 12th place time trial, Ross found himself racing near the Top 10 early on. Then, on lap 41, disaster struck. A lapped car in front of Chastain appeared to have had a radiator hose come undone, sending the driver spinning right into the side of the No. 4 Food City Camaro. He had nowhere to go, and was collected in a big way. Their day was cut short early, rendering Ross a 33rdplace finish. He loses points to the Playoff cutoff, but remains 13th in the season standings.